Shortarmguy's Crazy Emails: Farmer makes half-mile wide heart from manure!! Ladies, get-a-load of this Bull-sh*t True Valentines story!!!!! 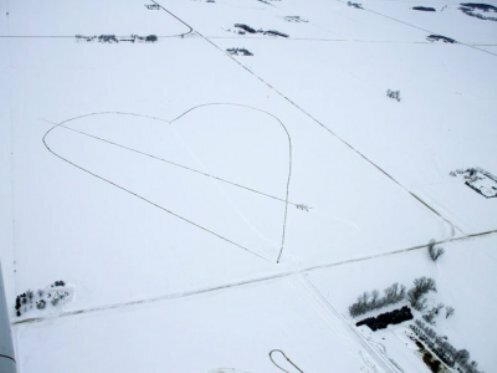 For his wife this Valentine's Day, a farmer has created a half-mile wide arrow-pierced heart recognizable from the sky about 12 miles southwest of Albert Lea. Following plans he jotted on scratch paper, Bruce Andersland drove his tractor and manure spreader earlier this week in the special shape for his wife, Beth. On Thursday afternoon, the Tribune was on the telephone with Beth when she had her first look at the aerial image, taken through Minnesota Aviation by Albert Lea pilot Darren Schone. With a gasp, Beth said, "Now I've got my Valentine! That's pretty cute." She said it was the biggest and most original Valentine she has received in her life. Bruce said he had the idea because the square-mile, snow-covered field seemed fitting for something. "There's such a nice field there. I thought we could just do it for fun," he said. Bruce began the project Wednesday and finished Thursday. The heart made of manure is recognizable only from the air. It is in Section 24 of Mansfield Township in Freeborn County. Beth first discovered he was working on the heart when he emptied his pockets on Wednesday night. She asked him about the scratch paper with the heart pattern on it, and he explained. "He thinks of cute things to do once in a while, so I was a little surprised," she said. Beth raises purebred Simmentals on their farm. That makes getting a Valentine made of manure actually a good thing. "That's just part of farm life. Doing something fun and creative with it makes farming fun," she said. The heart, she said, would be darker except for the heavy snowfall in the past week that fell in the cattle pens. The snow mixed with the manure, so the spreader ended up spreading manure and snow.